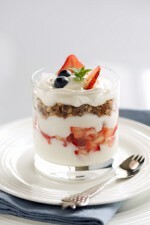 A fruit and granola parfait is perfect any time of day. Get a serving of fruit, calcium, and fiber in one little cup of yum! Add a thin layer of yogurt to the bottom of two cups. Add a layer of pomegranate kernels on top of the yogurt.